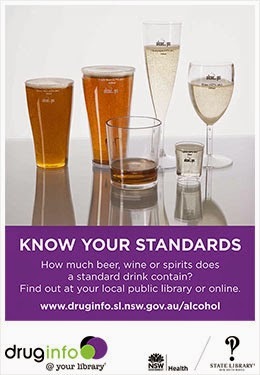 Know Your Standards Week is a week of activities held throughout NSW public libraries aiming to raise awareness about alcohol and standard drinks. Sutherland Shire Libraries are proud to support Know Your Standards Week by hosting displays providing a range of free information to the community on standard drinks. Displays will include Standard Drinks pocket guides and pens, various pamphlets and other material. Cronulla, Engadine, Menai and Sutherland Library displays will run from from Monday 1 - Saturday 6 June. Stocks of free material are limited so get in early!